Displays notes as you play them. See which ones are out of tune. For violin, iPhone and iPad. 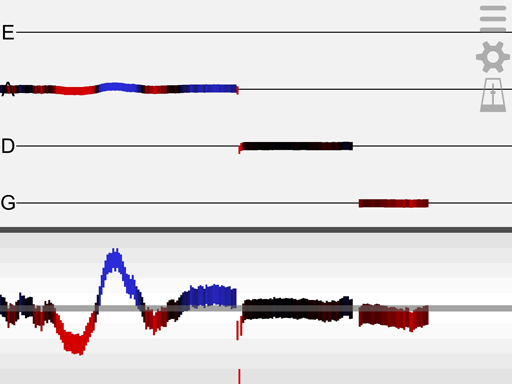 Music Wrench transcribes live violin playing in real time, including vibrato and double stops. It uses the iPhone or iPad’s built-in mic. The display is color-coded so that intonation errors can be quickly spotted. Music Wrench includes a metronome that can be used at the same time. Furthermore, you can rewind and replay your session to review your playing. Tuning mode is for open strings. 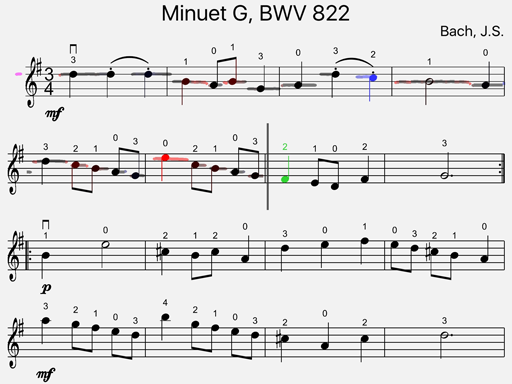 While the colors alone are enough for some, the bottom window gives a high-precision graph of intonation. Tuning across the strings can be configured for equal temperament or perfect fifths. 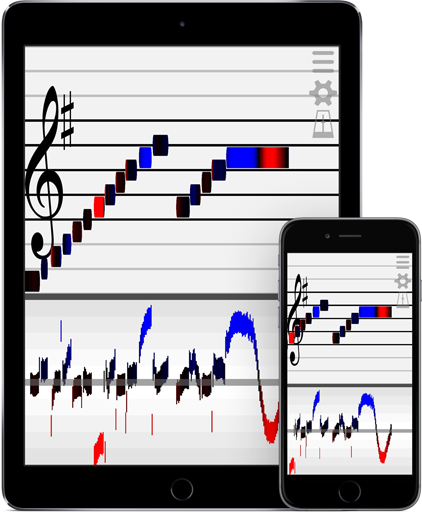 Practice mode shows intonation for all notes, from open G to two octaves above open E. Also, Music Wrench can visualize the metronome as vertical lines. 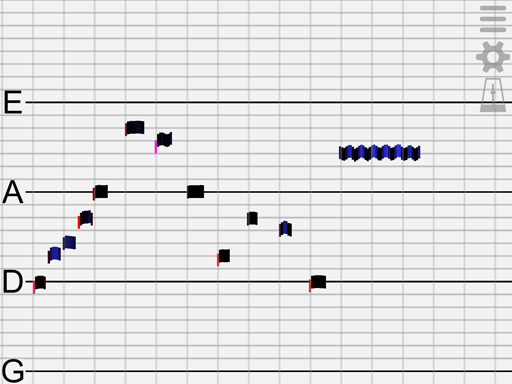 In this screenshot you can see that the start of each note is lining up with the metronome lines. Bach’s Concerto for Two Violins is being played with good timing. Practice mode can display multiple windows simultaneously. Shown is the treble staff display with two intonation windows. Music Wrench is the only app that can identify and tune double stops. Also available is a “just interval” window, which tunes the double stop interval. Finally, you can set the intonation system to equal-tempered, Pythagorean, or “just”. Play along with sheet music and get scored on intonation and timing. There are scales in every key from 1 to 3 octaves and a song list that gets updated regularly. 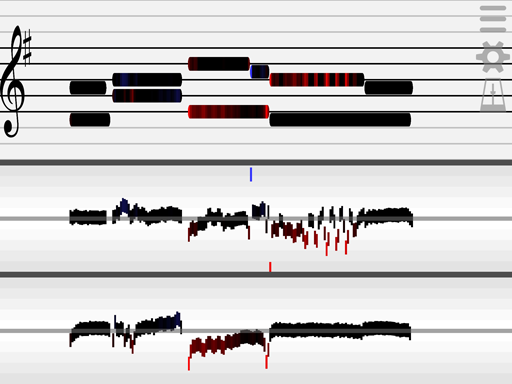 A cursor or a highlighted note can show the current location in the music. Just like the other modes, you can pause and replay your recording at any time. Music Wrench is free to download. Tuning mode is free, including metronome and record/playback capability. Select songs and scales are also free. Practice mode and all songs and scales can be unlocked with a single in-app purchase or a monthly subscription.